This video slot from Eyecon will transport you back to the Middle Ages, to a far off realm where magical beasts roam and knights bravely defend the majestic castle from jealous neighbouring rulers. The graphics are stunning and ensure a fully immersive experience to this fairy tale land. Players can stroll next to a shimmering river as they make their way towards the grand castle, whilst admiring the dramatic backdrop of snow-tipped mountains. It's a good opportunity try playing these casino slots today! Symbols include glistening gemstones in the shape of the card suits, a dashing knight, a wizened wizard, the king himself, and his pretty daughter the princess. Founded in 1997, Eyecon is based in Brisbane but their slots have international appeal. They have proven particularly successful within the UK market. This behemoth of the gaming industry combines years of experience with technological expertise and creative flair to ensure they remain at the forefront of the industry. Their formidable stature was recently demonstrated when they were acquired by Playtech for a whopping £50 million. Eyecon slots are typically quite simple, featuring cartoon-like graphics and bold colours. 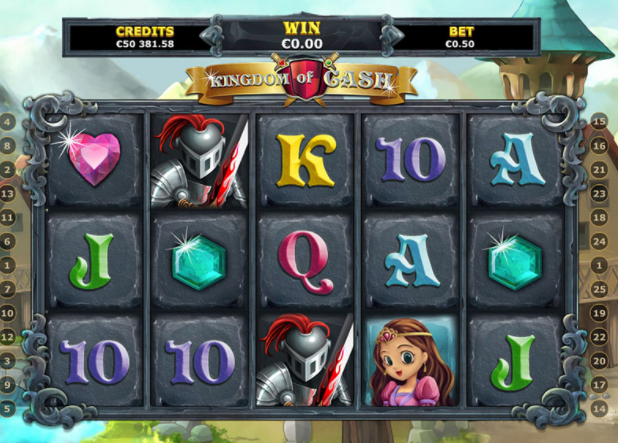 However, Kingdom of Cash shows that they are far-reaching skills that extend into quality immersive video slots. Check out our slot games online today. This is a 5 reel, 25 payline slot with a progressive jackpot. 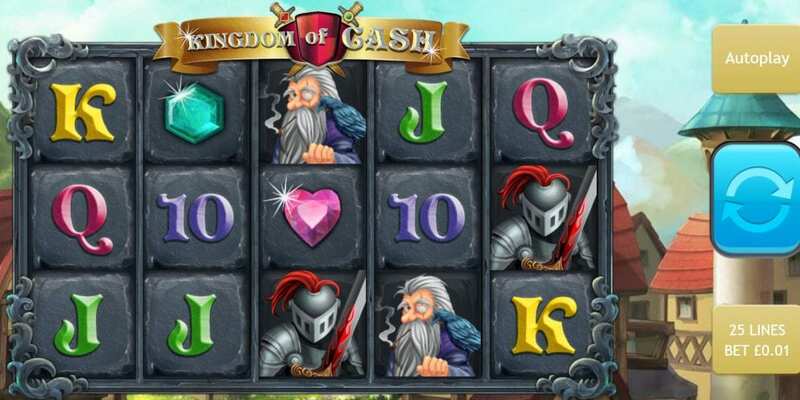 This means that there is no cap on the amount of treasure the medieval kingdom can amass – the more coins paid in, the higher the potential jackpot gets! You might want to read more details below before playing some. A gamble feature is on offer after every win, offering you the chance to double your winnings by making a correct choice at the risk of losing it all if you choose incorrectly! The classic card symbols are limited to a 300 coin win for lining up 5 of them on the reels, but the big rewards are of course linked to the prestigious characters that live within the castle walls themselves. For example, rounding up 5 knights in a row will reward you with 5,000 coins. The beautiful princess is always generous to her loyal subjects – as the Wild symbol in this slot she will be similarly generous to you. She can substitute for other symbols to help you secure more wins, and will double your prize every time she appears in a winning combination. Not only that, if 3 or more princesses appear on screen at any one time, you will be rewarded with 25 free spins during which time your winnings will be tripled! Players are sure to be swept away into the magical universe Eyecon have created in this video slot. Some large prizes are up for grabs thanks to the progressive jackpot and extensive bonus features including a standard gamble round and free spins. Spectacular graphics and a well-executed imaginative theme make this a slot not to be missed, so grab your sword and your trusty steed, and prepare to help protect the realm! If you enjoyed Kingdom of Cash Jackpot, you may like Temple of Ausar Jackpot.